In 2001 Ford partnered with Warner Bros to release a Bullitt edition of the GT Mustang that featured Dark Highland Green paint, and a subtle de-badged look similar to the '68 Fastback flown by Lt Frank Bullitt around the streets of San Francisco. The package also added a few MPH here & there with some small performance upgrades, but Ford released an even better version of the Bullitt in 2008 with the restyled 5th generation Fastback. 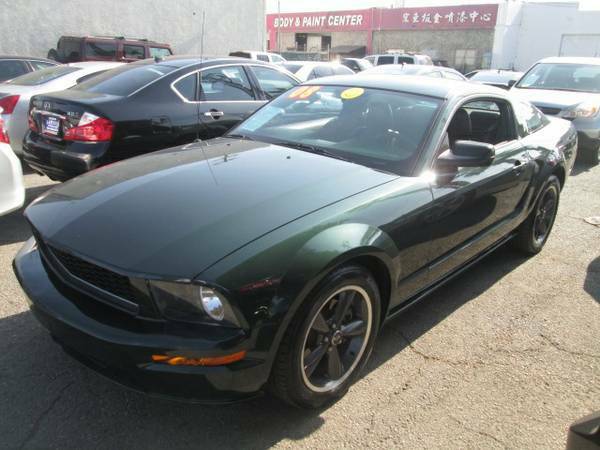 Find this 2008 Ford Mustang Bullitt offered for $9995 Los Angeles, CA via craigslist. I've always liked these Bullitt editions. I wonder how many miles are on it, but it does look nice. I hate ads that are in all caps. I agree, these have a great look. I have a bad feeling about this one though. I would bet that it was put back together. I called Junior to ask about the mileage and no one picked up. I'm out of town so didn't leave a call back number. Was his voice mail greeting shouted at full volume?